A solid choice for the money, this 2017 entry is the new upgrade to the previous 49UH610V model. Although it's slightly smaller than previous iterations, it now boasts more features than ever before. 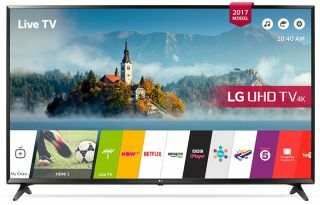 For around £330 you'll get a vibrant display supporting both 4K and HDR, as well as LG's proprietary webOS - An easy to use software that can support all your favourite streaming apps. Audio is also covered with LG's multi channel ULTRA Surround technology, a nice bonus at this price point.